On 21st September 2013 It was another solo to blow away a few cob webs. Like my Secret Perch Video this would be by the sea on the Northumberland coast between Amble and Cresswell just north of Druridge Bay looking out to Coquet Island. Finding somewhere to pitch a tent wasn’t that easy, I took my Terra Nova Jupiter Bivy as well as the Akto to increase these options. I left my Msr Dragonfly at home and brought my Whitebox stove as room in my small Osprey Raptor pack is very limited. The intentions for this camp was to stuff everything into the smallest pack I had and be able to sleep in the bivy with the pack inside. Looking around bay I seen a few bivy pitches but pitching a tent was a bit iffy as I noticed signs warning of camping probs because of people leaving rubbish and fire pits. So I headed up the coast to another area I have walked before and seen a nice level pitch right on a grassy bank just off the beach but insects were a big problem, just putting my tent bag down it was covered in minutes so I headed just up the hill about 20ft where there was a breeze and that problem was reduced but the ground was somewhat uneven but I pitched anyway. Weather was quite warm an “Indian summer” was upon us, high pressure which would only last a couple of days so this camp was a must do. I knew the sunrise wouldn’t be as red and spectacular as the one on the Secret Perch because the high pressure had just came in and wasn’t leaving us. Daveswildcamping kitchen was even less spectacular with two “Look what we’ve found” boil in the bags and two bags of rice. This was due to the little room in my small pack as I had to improvise and also bring something along which I could eat cold and uncooked in case I had problems with the stove or lack of fuel to cook it. The whitebox stove isn’t suitable for cooking inside the tent due to its unpredictability, may try my Brasslite or trangia next time. As darkness fell so were my eye lids the sea air had made me feel very sleepy and at around 20:00 hours I was nodding off. The wind picked up later on although not to strong and there was even a sprinkle of rain for a few minutes. Skies were pretty cloudy most of the night with just a few twinkles from a few stars shining between them. For breakfast I had one of the two boil in the bags and some cereal bars and I sat for a few hours soaking in the sun and the sounds of the breaking waves. Another fulfilling and a pleased I done wildcamp, check my video below. The Northumberland Coast is a designated Area of Outstanding Natural Beauty (AONB) covering 100 miles of coastline from Berwick-Upon-Tweed to the River Coquet estuary in the Northeast of England. Features include: Alnmouth, Bamburgh, Beadnell, Budle Bay, Cocklawburn Beach, Craster, Dunstanburgh Castle, the Farne Islands, Lindisfarne, Seahouses and Amble. 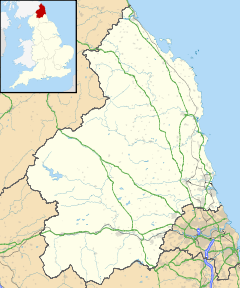 It lies within the natural region of the North Northumberland Coastal Plain. The coastal area is situated to the east of the A1 road. It is sparsely populated and includes sandy beaches, sand dunes, rugged cliffs and isolated islands. It includes two National Nature Reserves. Fortresses and peel towers along the coast are evidence of past conflicts between the English and Scots in this border area. Coal fields are nearby and 'sea coal' is washed up on the beaches. This Northumberland location article is a stub. You can help Wikipedia by expanding it. Coquet Island /ˈkoʊkət/ is a small island of about 6 hectares (15 acres), situated 1.2 kilometres (0.75 mi) off Amble on the Northumberland coast, northeast England. The Island is owned by the Duke of Northumberland. The Royal Society for the Protection of Birds manage the island as a bird reserve, for its important seabird colonies. The most numerous species is the puffin, with over 18,000 pairs nesting in 2002, but the island is most important for the largest colony of the endangered roseate tern in Britain, which, thanks to conservation measures including the provision of nestboxes to protect the nests from gulls and bad weather, has risen to 92 pairs in 2005. Other nesting birds include sandwich tern, common tern, arctic tern, black-legged kittiwake, fulmar, three gull species, and eider duck. The island is uninhabited in winter, but seasonal wardens are present throughout the summer to protect the nesting birds. Landing on Coquet Island for the general public is prohibited, but local boating companies from Amble sail close up to the island in good weather throughout the summer, allowing visitors to get good views of the Puffins and Roseate Terns. Coquet Island also holds the remaining structure of a medieval monastery on the south western shore, which was largely incorporated into the 19th-century lighthouse and lighthouse keepers' cottages. Coquet Lighthouse was built by Trinity House in 1841 at a cost of £3,268. James Walker designed the lighthouse, which is a white square tower of sandstone, with walls more than one metre thick, surrounded by a turreted parapet. The first keeper at Coquet Lighthouse was William Darling, the elder brother of Grace Darling. The lighthouse is now automatic with no resident keeper. The Farne Islands; another important bird reserve about 30 km to the north. Henry of Coquet (12th century) - Danish hermit and miracleworking saint who lived on this island. ^ "Coquet Lighthouse". Trinity House. Tide times for Coquet Island from the BBC and Easytide. History of Coquet Island. (Modified from "A History of Northumberland", volume V, by John Crawford Hodgson. Published 1899). This entry was posted	on Thursday, September 26th, 2013 at 5:52 pm	and is filed under Northumberland Coast. You can follow any responses to this entry through the RSS 2.0 feed. Both comments and pings are currently closed. Powered by WordPress v 4.7.13. Page in 0.493 seconds.